Ideal Tax Solution, LLC is notifying interested taxpayers of current issues recently addressed by William Wilkins at a March 18th gathering of tax executives. Funding reduction caused by sequestration is a high priority issue for the 2013 fiscal year. Ideal Tax Solution, LLC has learned the topic of budget reduction is receiving considerable attention among IRS officials charged with administrating tax law for the federal government. The Continuing Resolution passed in the fall of 2012 kept the current fiscal year budget at the 2012 level. However, the IRS budget for 2012 was a significant reduction from 2011. Uncertainty on funding for the remainder of fiscal year 2013 ending in October is being fueled by the pending deadline for the current CR, which runs out on March 27. The tax professionals at Ideal Tax Solution have discovered the IRS is taking aggressive steps to enable it be in compliance with budgetary constraints. Actions already in place include hiring freezes, reduced grant funding and cutbacks in travel and training. Furloughs are almost a certainty as employee pay is the greatest expense by far for the IRS, but none will be implemented before summer. Ideal Tax Solution is advising its clients to remain current on any IRS tax liability, as there will be no reduction of IRS personnel during filing season. In addition to the budget issue, another tough challenged faced the IRS involved a number of retroactive tax changes contained in a bill passed on January 1st by Congress. The new regulations caused a delay in the ability of the IRS to process some returns before January 30. Ideal Tax Solution carefully counseled its clients regarding filing restrictions instituted as a result of congressional mandates. Issue management was also discussed in relation to more efficiently and effectively finding ways to resolve issues with the business community. Part of that strategy revolved around identifying issues for audit that will have the broadest impact on compliance regardless of entity size or type. 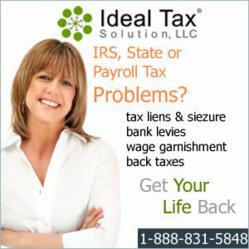 Ideal Tax Solution will stay abreast of any changes to current IRS rules.